Glows any color out of the box! Made in the U. 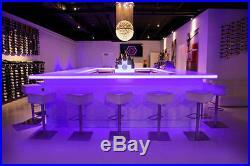 This LED lighted BAR Top is the perfect accessory for any contemporary decoration. Create a warm ambiance anywhere you wish. Ideal for restaurants, hotels, night clubs, event planners, pool parties, venue, tv shows or even for your beautiful home or condo. 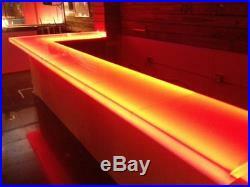 Unlike other lighted bar tops, OUR BAR TOPS GLOW ALL AROUND INCLUDING SIDES & BOTTOM! 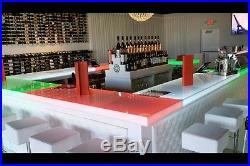 Includes: Qty 1 Acrylic Bar Top. Dimensions:3 x 24 x 12. 20 color changing lighting system with remote control. Brackets to sustain project to base. Plug in to outlet. Cool to touch No fire hazard. Wide variety of settings. 20 different colors. Strong resistance to impact. Energy saver – Environment friendly. 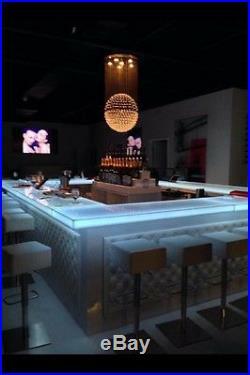 Light up Bar surfaces custom built for your establishment! Ready to install on site with plug and play operation. 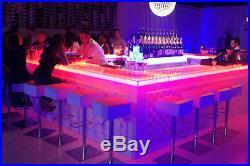 This is a basic multi-color custom light up bar surface. Choose from solid color shades, color jump, color fade, strobe & more. 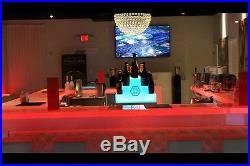 LED lighted Bar Tops make great mood food/beverage displays, or accent lighting pieces. This piece is strong and durable, and since it’s acrylic it won’t yellow in sunlight. Made out of 3/8 thick Acrylic (Heavy Duty). Perfect for restaurants, hotels, nightclubs, tv shows, caterers, event planners, or even for your beautiful home or condo. Check out our DIY picture (Do it yourself). Nothing but a small thin remote control to change colors! The process starts by giving us the specifications of your Bar. We’ll need length and depth. Once approved and paid for we’ll begin construction. Custom Bar surfaces can be completed from 5-10 days in most circumstances. This version includes 24 wide Bar tops or less. We can build to any size, shape or dimensions. We can brand these products with your organizations logo for additional charge. 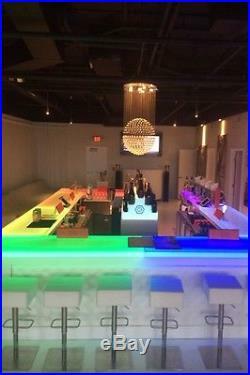 WE CAN ALSO MANUFACTURE: BAR BASES, BACK BARS, DJ BOOTHS, LED DANCE FLOORS, UPLIGHTING, COCKTAIL TABLES, HI-BOY TABLES, ACRYLIC CUBES, BUFFET TABLES, CATERING DISPLAYS, CAKE STANDS, CABANAS, ILLUMINATED SCULPTURES. Become fan on Facebook: Good Life DESIGN GROUP. Credit Cards with billing address in USA Only! No APO/FPO or PO Box. 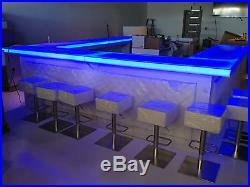 The item “Home Bar Furniture, 12x24x3, LED Bar Top, Sold By The Foot” is in sale since Friday, May 5, 2017. This item is in the category “Home & Garden\Kitchen, Dining & Bar\Bar Tools & Accessories\Home Pubs & Bars”. 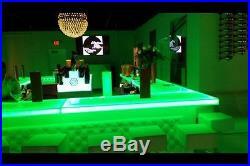 The seller is “glifedg” and is located in Hialeah, Florida. This item can be shipped to United States.